APRIL 1 FROM THE DC ARMORY IN WASHINGTON, D.C.
WASHINGTON, D.C. (April 2, 2016) – Four-division world champion Adrien “The Problem” Broner didn’t have much of a problem beating and stopping Ashley “The Treasure” Theophane at 1:10 in the ninth round in the main event of tonight’s Premier Boxing Champions (PBC) on Spike event in front of a sold out crowd of 8,172 at the DC Armory in Washington, D.C.
At 26-years-old, Broner, who lost his 140-pound world title on the scale when he failed to make the bout’s weight limit, improved his record to 32-2, 24 KOs. The controversial fighter from Cincinnati, Ohio, displayed his strength and range of skills against a seasoned Theophane, whose record dropped to 39-7-1, 11 KOs. WASHINGTON -- Adrien Broner had a very bad week, but he at least finished it with a bright spot: a dominating, ninth-round knockout victory of Ashley Theophane on Friday in the main event of a Premier Boxing Champions card at the DC Armory. Broner then called out retired superstar Floyd Mayweather, who was ringside, though Broner has major legal problems to address first, and Mayweather would have to come out of retirement. Moments ago at the DC Armory in Washington DC, former world champion Adrien Broner defeated jr. welterweight contender Ashley Theophane via 9th round stoppage. 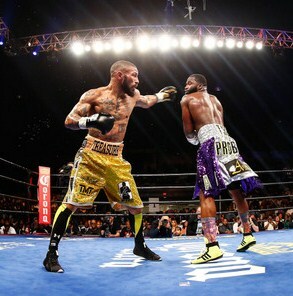 Theophane tried to apply pressure on Broner throughout the night, but it was clear that his punches weren't having any affect on the bigger Broner. It didn't take long for Broner's superior boxing skills to take over, finding a home for his right hand and some hard uppercuts. A solid combination from Broner staggered Theophane in the 9th round and a follow-up barrage prompted the referee to wave it off. Relive all the action in FightHype's round-by-round results.